To celebrate the release of Studio Ghibli’s celebrated anime When Marnie Was There, which is out on Blu-ray and DVD now, we have an exciting competition for you. We are offering three lucky winners the chance to win a copy of the film on Blu-ray. 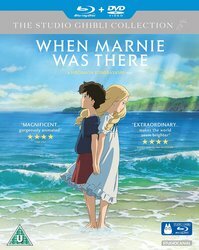 From director Hiromasa Yonebayashi (Arrietty) and general producer Toshio Suzuki, When Marnie Was There is a sweeping story of friendship, mystery and discovery that delivers stirring emotions and breathtaking animation as only Studio Ghibli can. Adapted from the beloved British children’s classic by Joan G Robinson, Yonebayashi has transported the setting from coastal Norfolk to seaside Japan while still showcasing the studio’s love of European influences and storytelling and its long held devotion to the environment and nature. When Shy Artistic Anna moves to the seaside to live with her aunt and uncle, she stumbles upon an old mansion surrounded by marshes, and the mysterious young girl, Marnie, who lives there. The two girls instantly form a unique connection and friendship that blurs the lines between fantasy and reality. When Marnie Was There is out on Blu-ray and DVD now. The competition closes at 23.59 (GMT) on Tuesday 18th October 2016.